It is on the top floor so that the ceiling is high which makes it more comfortable. It is composed of a living-room with a sofa-bed and an open-plan kitchen, a large bedroom with a double bed and a bathroom. On the river side, a South-oriented balcony with no vis-a-vis. 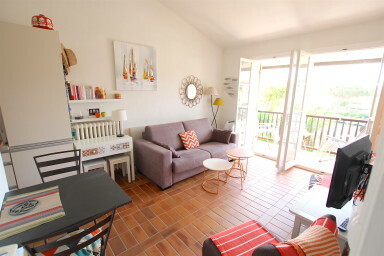 A very nice apartment to spend holidays in Port Grimaud!